Is the land market the root cause of the UK’s housing crisis? The conventional wisdom is that rocketing house prices have caused the UK’s broken housing market. But a new report claims that the real culprit is the land market and has called on the government to stop landowners raking in huge profits from land speculation. Few people would disagree that the UK housing market needs urgent reform. Every year brings new calls for more homes as housing demand lags ever further behind supply. The two main reasons given for this are as follows. First, (so the government says), large developers are sitting on land that could be freed up for the development of much-needed new homes. Second, (so the developers say), the UK’s planning rules are too slow and cumbersome, causing a blockage in the system. As ever, there is probably some truth in both these arguments as we wrote about in a recent blog. Now, a new report has claimed that the real cause of our housing problems is what it calls “the UK’s dysfunctional land market and soaring land values”. This, says the Institute for Public Policy Research in a report titled The Invisible Land, has “helped create the conditions for a broken housing market, and are a root cause of an unproductive and unstable economy”. The report says that in 1995, the price paid for a home was almost evenly split between the land and the property. By 2016, the land had risen to over 70% of the price paid, and this will rise to 83% by 2036. 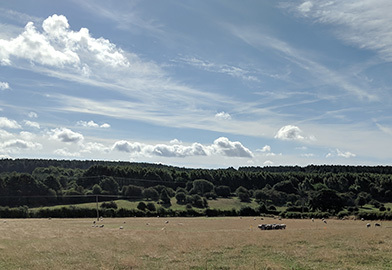 In the report, the example is given of a hectare of agricultural land in Oxfordshire that would typically be worth £25,000 without residential planning permission. With such permission it would be worth £5.6m, a multiple of 224. It wants to take steps to banish these types of windfall gains for landowners. The report makes several proposals for reforming the land market. The most eye-catching of these is the reform of the compulsory purchase laws to allow local authorities to buy land at fair value. This would remove the requirement for them to pay speculative ‘hope’ value based on prospective future planning permissions. This is the approach taken in Germany and the Netherlands. Another proposal that follows Germany and the Netherlands is that planning authorities should have the power to ‘zone’ areas of land for development and freeze its price close to its current use value. The suggestion is that “landowners would still get a fair return, but any windfall would accrue to the state to pay for infrastructure and affordable housing to benefit the local community”. The ending of the fire-sale of public land to the highest bidder. Instead, public land should be used to deliver genuinely affordable developments. Local authorities should be allowed to borrow to finance housebuilding. The government should set new guidelines for a minimum proportion of new housing developments to be genuinely affordable. As a mezzanine lender that works closely with developers, we are aware of the struggles they face to buy land at prices that make development feasible. This can be exacerbated by large developers, who have the buying power to snap up land and sit on it. As such, we welcome these proposals and will be keeping a keen eye out for the government’s response. In the meantime, if you would like to discuss mezzanine funding for your next development, please contact us now.